This is one of those, “I’m sorry but not sorry” post. 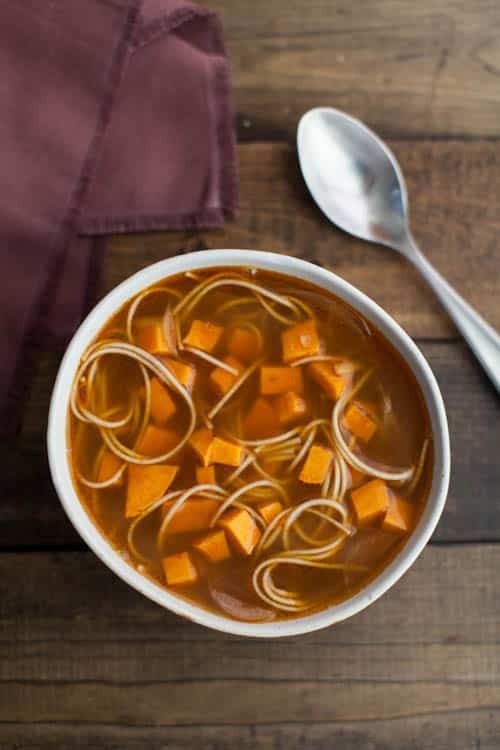 Yes, I know it’s technically the first day of spring and yes, I know soup is probably the last thing you want to think about (I say as I’m about to head outside and grill.) 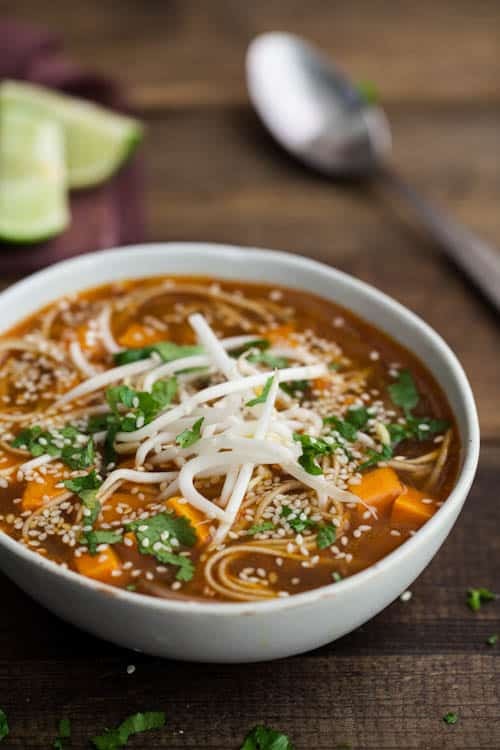 But, I can promise you, this is a good recipe to have around for those slightly cooler days or days you might not be feeling the best. I’m currently finishing up testing on a large chunk of fall and winter recipes for the cookbook and thus sweet potatoes are still filling my kitchen. In a pot, heat olive oil over medium-low heat. Stir in the thinly sliced red onion and cook until soft, 4-5 minutes. Add the minced garlic and minced ginger, cooking for 1 minute more. Next, measure in 4 cups vegetable broth, lime juice, sriracha, and soy sauce. Bring to a boil and reduce to a simmer. 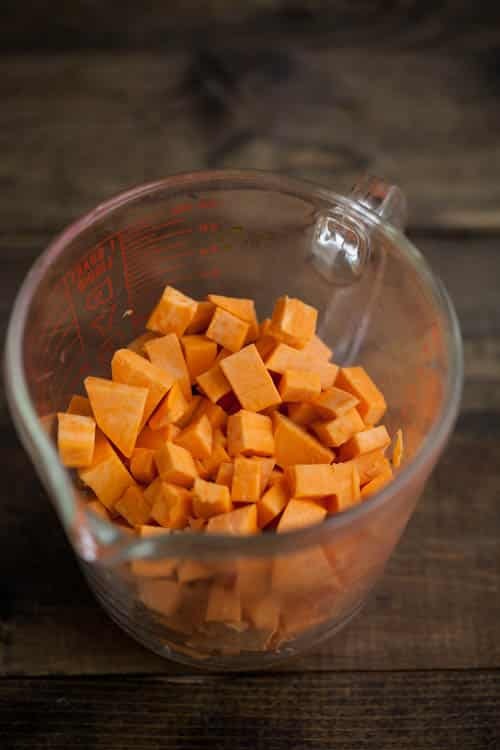 Add sweet potatoes and cook for 7-8 minutes, just until the sweet potatoes are tender, but not too soft. Finally, stir in the noodles and cook for another 3-4 minutes or until the noodles are soft, adding the remaining cup of broth as needed. 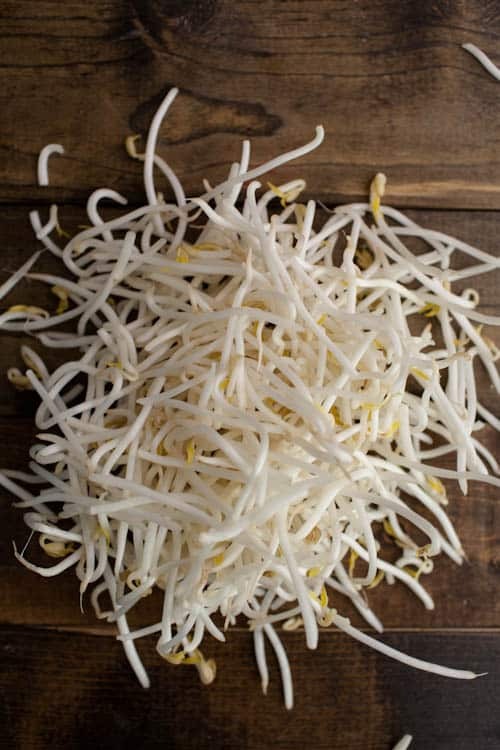 Divide into two bowls and top with minced cilantro, bean sprouts, sesame seeds, and extra lime juice. *I typically love spicy. 1 tablespoon of sriracha provides a lovely flavor with just the tiniest bit of heat. 2 tablespoons bumps the heat up. Start with 1 and add more only after tasting. 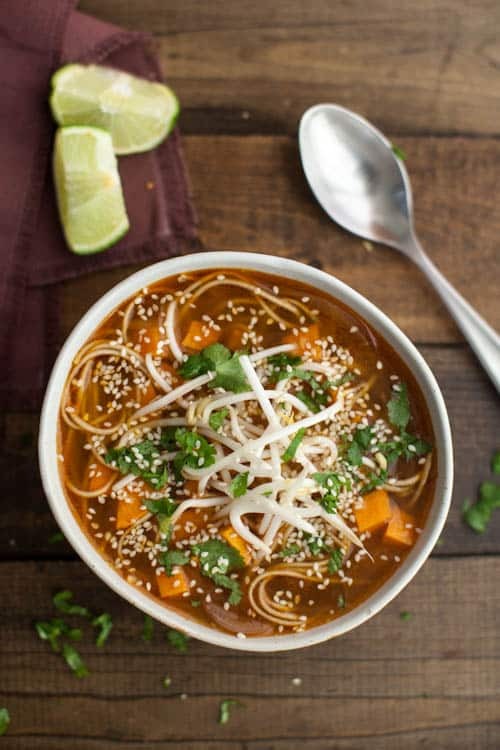 This soup looks truly killer – so yummy! It is so still soup season here in Chicago!!! This makes me want to say, “MMMM, Noodle Soup.” Like Joey from Friends. Im all for adding soy and ginger to everything at the moment too – and a squeeze of fresh lime juice. 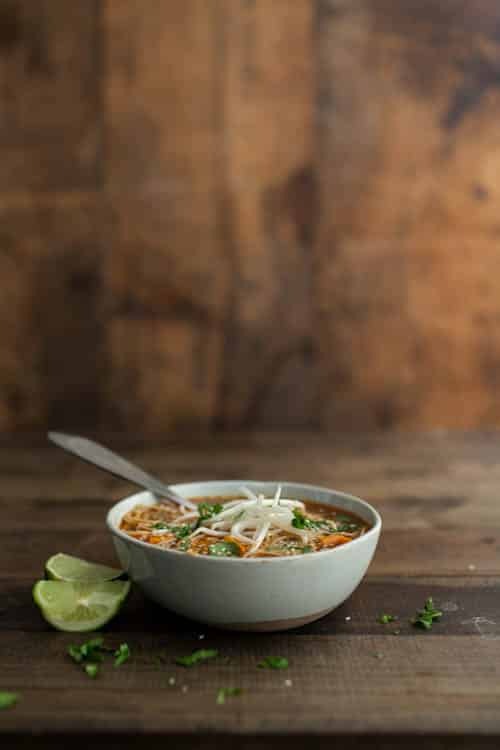 This soups sounds delicious, and perfect for the cooler weather we’ve been having heading into winter down here in Australia! We still have a few sweet taters left from our fall harvest. This soup sounds right up my alley. Any excuse to use up more of our sriracha stash is always a good thing! Spring is absolutely still soup weather, at least for us in Switzerland. We have warm, sunny days but they disappear in a flash so I continue to make soups. And this by the way looks gorgeous. Love the bold flavors and noodles in here!! I love the idea of adding something wildly hot against the subtle sweetness of the sweet potato. Great idea! And the photos are beautiful. Can’t wait to try this! Question though – does cooking with sesame oil dull that sesame flavor? Hey Amy, this doesn’t have a strong sesame flavor to begin with but I prefer to use it in place of olive oil to work with the flavors. You can always switch it out and use it as a finishing oil instead if you want more flavor! 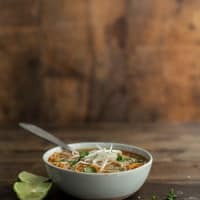 I am always up for soup and this looks amazing! Great recipe! Looks yum, I must try it. You don’t have to ask me twice! Putting sriracha and sweet potatoes in the same recipe are a guaranteed LOVE for me. Everything is so delicious in the spring, so you’re right – simple is the way to go to really let all the great flavors shine through. And this by the way looks gorgeous. Made this tonight and it is truly, truly delicious. Thanks for it! I’m sure this is something we’ll make time and time again. Chi-beria on monday, so this recipe was perfect. yum! thanks for sharing it! y’all, this is DELICIOUS. my roomie and I made this last night and just FAWNED over how good it was. I think we left the sweet potatoes cooking a little longer than this recipe says, but I think I also accidentally turned the heat down too low so it wasn’t quite ‘simmering’ while the potatoes were in there, so oops. we also used brown rice vermicelli instead of soba noodles because it’s all our tiny grocery store had to offer, but it was totally delicious. 10/10, will make again! I just made this exactly as directed. It is DELICIOUS. So easy to prepare, and the results are restaurant-quality. Thanks for sharing this! making this tonight, cant wait to try it! is it just me, or do the ingredients call for 5 cups of broth but the directions only state the use of 4 cups of broth? thanks! I ended up using all 5 cups and it was absolutely delicious! Oh, and I used Udon noodles instead of Soba…my grocery store was out of Soba. You should add this to the recipe, as I am making it now and already added the 5 cups before scrolling down to read this. Hi Bethany- in the instructions it does say to add only 4 cups but I will add a line about using the extra cup if necessary. Best! I’m enjoying this for lunch today. I had to make a couple of substitutions based on what I had available (lemon for lime and ground ginger for minced) and it is quite good. Thank you! I’m a student, and this is my favourite ugh-I-don’t-want-to-go-grocery-shopping-and-I-have-a-sweet-potato-wtf-do-I-do-now meal. I’ve made it countless times, and have also used it as a meal to clear out the random few leaves of bok choy, bottom of a can of chickpeas, and the last mushroom in the fridge sort of thing. I basically make this is my sleep, eyeballing all of the measurements to create a totally customizable, easy peasy, quick meal. so, thank you for this! Thank you for this! It forced me to use ingredients I don’t typically use (Soba Noodles) and it was super easy to make. It turned out to be D E L I C I O U S ! First visit to your site and now on to check out different recipes. This one was wonderful! This was soooo good! Definitely a keeper!